Dash, short for „digital cash“, is the sixth biggest crypto currency by market cap worldwide to date. Since the beginning of 2017, its price, like a lot of other crypto currencies, has seen an explosion. Whereas Bitcoin is a popular currency for traders and Ethereum ist the popular platform for ICOs, Dash tries to position itself as an actual payment method. Its website lists hundreds of online stores that accept Dash coins to buy goods and services. Trending Topics took the chance to speak with Ryan Taylor, the CEO of Dash, about the future of Dash, its differences to other crypto currencies, and his take on the current hype around ICOs, Bitcoin and Blockchain. Trending Topics: Why was Dash started as a new cryptocurrency? Ryan Taylor: Dash was originally released in January of 2014 by founder Evan Duffield. 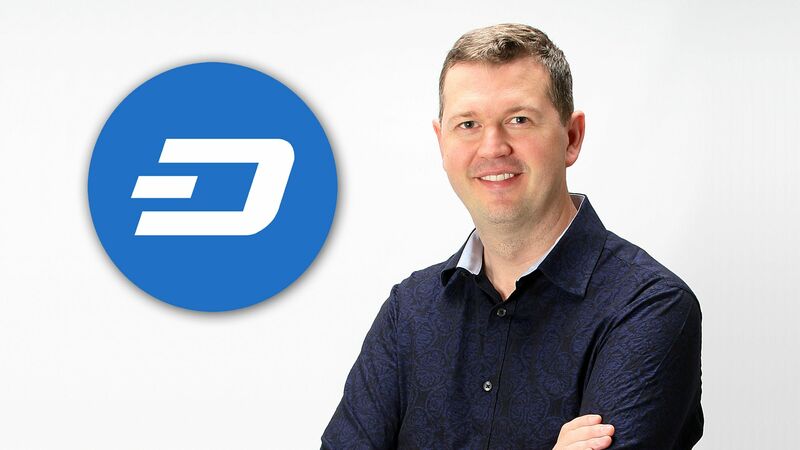 Dash is a portmanteau of „Digital Cash.“ With strong year over year growth since, Dash has become the top digital currency focused on payments and commerce, and now has a total market capitalization of $2.5 billion USD. I joined the Dash project as Director of Finance for the Dash core team last year, and transitioned to CEO in April this year after migrating from a traditional Wall Street career. I was a hedge fund analyst covering a global stable of payments industry investments for the private equity and public market funds of a $20 billion investment firm based in New York, and previously served as an Associate Partner in McKinsey & Company’s Business Technology Office in New York. The Dash Core Team is responsible for developing the currency, improving the network, and seeking new business opportunities, integrations and partnerships with merchants, retailers, consumer services and payment gateways. What is the main purpose of Dash? Dash is an open-source project that delivers safe decentralized financial solutions. It is a form of digital cash that can be spent online and at merchants and service providers worldwide. Unlike Bitcoin, Dash can be sent and received instantly, with zero risk of double payment or theft, and it boasts tremendous stability in its value. Dash has rapidly become the number one digital currency for payments because of our cheap and instant transactions, anywhere in the world. How is Dash different from other cryptocurrencies? Dash is in many ways a better Bitcoin. It is quickly incorporating payments industry best-practices that the digital currency industry has lacked. Dash transactions lock within a couple of seconds due to our revolutionary second tier masternode network, making Dash acceptance feasible at the point of sale and online, just like credit cards. Dash also differs from every other digital currency because of our unique governance and treasury model, which allows a portion of newly mined Dash to fund projects, integrations and partnerships for the purpose of increasing worldwide use. Dash claims to be privacy-centric. Other cryptos also claim to be anonymous. How is privacy different with Dash? Privacy is just one of the optional features that Dash incorporates into its overall user interface, but our objective is far removed from the true privacy-centric cryptocurrencies, some of which are targeting users of the DarkNet markets. Dash is going in the complete opposite direction; we are going for mass adoption. It’s also important to note that less than 1% of Dash transactions are privacy enabled (through a pool mixing process), and is therefore not a requirement to our users or a necessity for scaling. Do you regard PayPal as your main competitor? Our upcoming Evolution product looks and feels like online banking and will be global, however unlike PayPal and Venmo, it will be entirely decentralized, with increased security, significantly lower fees, and no middlemen taking cuts on either side of transactions. It will be an entirely seamless payment method, with no geographical restrictions. Users can pay friends and shop online as easily as they do with PayPal without losing privacy and control of their money to a third party. Services like PayPal control your money and mine your transaction data. PayPal will even reverse transactions without providing an opportunity to dispute the reversal. With Dash, you control your money and can’t be restricted from using it or having money that was previously sent to you reversed. Just like physical cash, there’s no need to pass along personal information and once you receive it; that transaction is secure. I think consumers and merchants will appreciate the advantages while retaining the ease-of-use aspects that have made PayPal successful. What is your opinion on ICOs? Is it a hype or longer lasting trend? There is a lot of hype surrounding ICOs at the moment and while ICOs certainly have their advantages and place in the market, they can also be exploited by bad actors. Because the digital token market is so new, many investors lack the necessary sophistication to assess or appreciate the viability, sustainability, and governance of projects that are raising hundreds of millions of dollars in capital. Such an environment is ripe for abuse, fraud, and waste. The SEC has begun providing guidance and clarity to the market on how it will treat ICOs. I firmly believe that regulation will support digital currencies, and that digital currencies are here to stay. They will become an extremely popular option for payments and remittances all over the world and provide countless advantages over fiat. What is your opinion on state issued cryptocurrencies? Russia, Estonia and others are thinking about it. I find that very interesting and think that in some countries, government backed digital currencies could be a significant catalyst for faster mainstream adoption. Digital currency is a suitable payment method in almost any environment. When people have the confidence that their digital coins are as valuable and useful as the dollar in their pocket, everyone will begin using it for everyday transactions. Governments like Russia and Estonia are beginning to see the tremendous advantage of using digital currency over fiat and are exploring how to implement it into their national economies. After China banned ICOs and exchanges, Beijing announced they are considering minting their own government run digital currency because the digital coin could stabilize the yuan, which has been losing value in the past two years. Some say that the blockchain is here to stay while crypto currencies are not. Your opinion? I see both digital currencies and blockchain technology thriving in the future. The benefits of blockchain, such as digital currency, are immeasurable. The fact is that digital currencies possess attributes and capabilities unique to any existing payment method, simply because they can be cheaper, faster, more accessible (particularly to the unbanked and underbanked) and are not controlled by a central entity or government. At this point, the market for digital currencies has expanded exponentially. I don’t think anyone can stop that growth from continuing. The blockchain, whilst relatively new, is becoming an absolute vertical technology, infiltrating industries like healthcare, social media, financial services, philanthropy, cyber security, identity, voting, IOT, video gaming, real estate, logistics and supply chain, just to name a few.